1. All those perfect photos you see on social media are ridiculously hard to achieve, and even more so when you are trying to take them yourself! My phone timer became my friend, and I took screen shots of video when it took longer than 10 seconds (darn you iPhone) to get into a pose. Racing the setting sun (and the timer) to get my pose and picture. 2. You can’t cheat a warmup. Some poses take a generous amount of time to achieve. You can’t rush it because in the end your pose won’t be as strong as it could be, and you can hurt yourself. 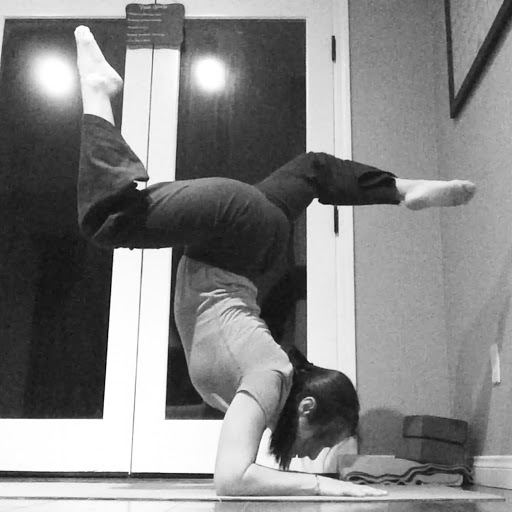 Although this pose looks simple enough, it is one of my hardest. I have to warm up many parts of my body, use the wall to find my balance, and then try it free standing. That face of concentration says it all. After all this I had spent a fair amount of energy on the pose, and could only spare a little more to get this out of frame photo. 3. 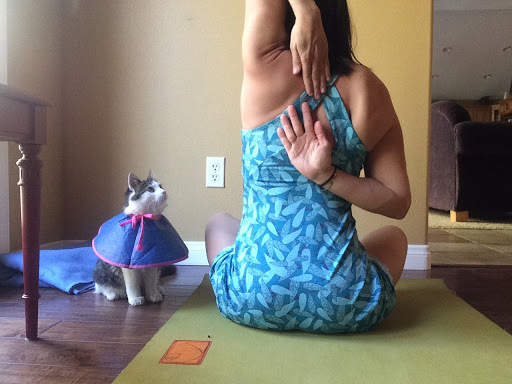 Your yogi friends are the best friends! SO much support and help came from yoga lovers, instructors, and studio pals. My experience was richer because of all those that helped me! 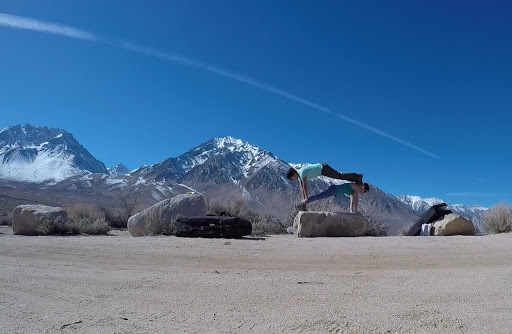 Mariapaz and I in Bishop below the Sierra mountains playing with acro yoga. 4. Arm muscles, my gosh, the arm muscles! 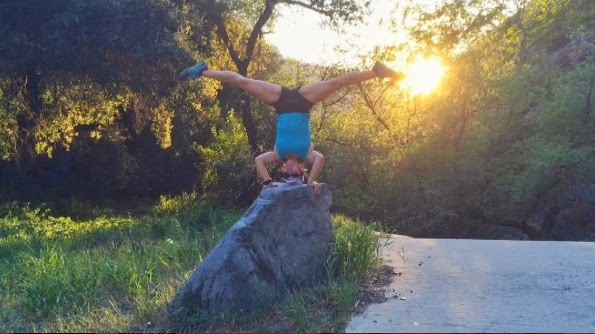 Not surprisingly I gravitated towards arm balances. 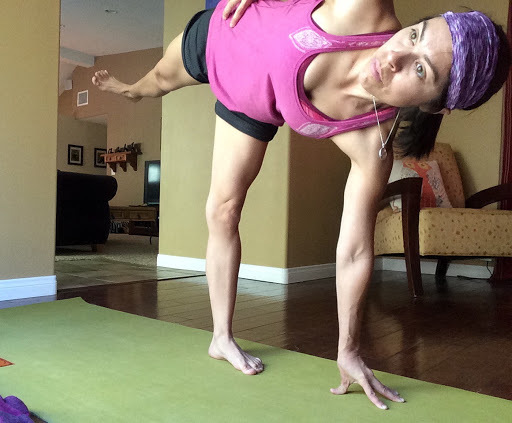 These tricky poses strengthened my core, shoulders, arms, and back muscles. These new muscles (hello tricep and brachialis) make me a stronger climber. 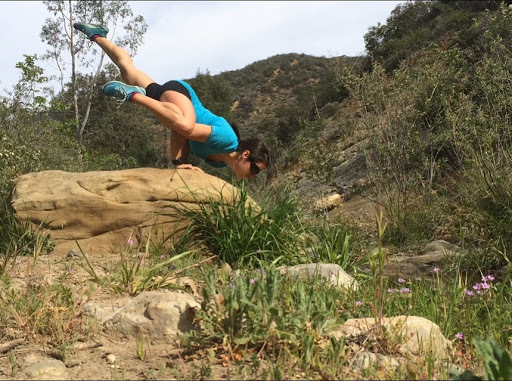 If I can find a flat enough rock outside I’ll try an arm balance. 5. 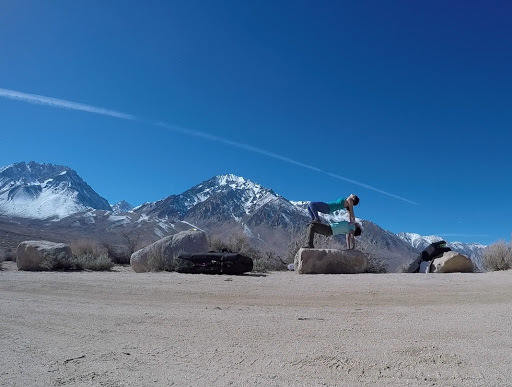 Climbing is anti yoga. 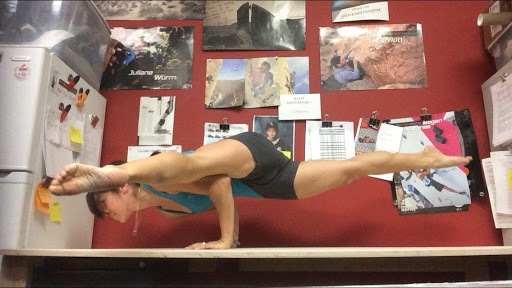 There is a lot of pulling (flexion) in climbing, and I found that yoga works many of the opposing pushing (extension) muscles I have. This rounds out my fitness and keeps my body safer from injury. My athletic sponsors: Mad Rock Climbing (climbing shoes) and Stonewear Designs (which is 90% of what I’m wearing in these photos). 6. Sanskrit is not easy for me. I’m a visual and kinesthetic learner, which means even hearing Sanskrit names of poses a thousand times does not commit the words to memory. I tried looking up Sanskrit words for poses and found I can’t pronounce the names, thus not being able to verbalize them made them again seemingly impossible to learn. I tried repeating them quietly to myself at my studio practice, which sorta helped me to learn a few names. Real solution? Learn Sanskrit, like a second language. It’ll help me in the future, when I eventually commit to becoming a teacher. (I Googled every name for this post). This pose is not easy for my either. Tight shoulders and forearms from climbing. I love seeing my progress. 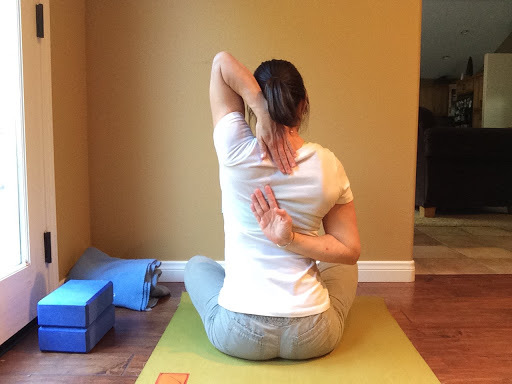 Paschima Namaskarasana. 7. Running is anti yoga. I will never give up running as long as I can do it physical. Although, the exercise tightens my muscles, especially my hamstrings and legs in general. 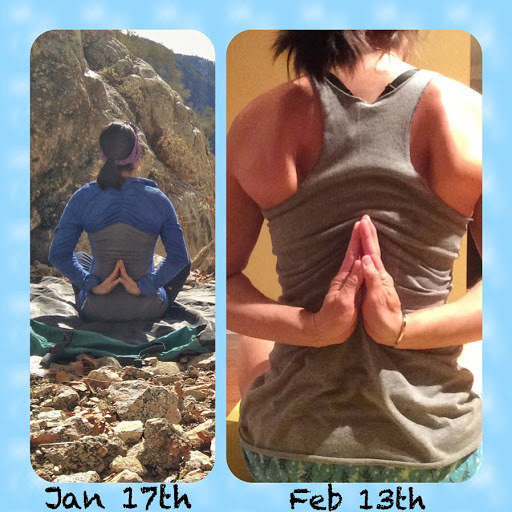 I began my yoga journey in earnest trying to combat the aches and pains of running. I’ve taken it far beyond that and have once again seen the benefits affect another beloved sport/activity/lifestyle of mine. Two difficult poses in one. Reverse prayer and intense side stretch. 8. Hamstrings, everydamnday! I’ve learned to love them, and push them into loving me back. I stretch them daily, and my husband has commented that he thinks my thighs are longer and leaner for it. I choose to believe him. 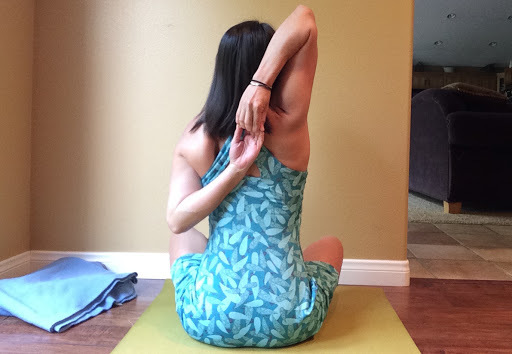 Takes me a lot of work to warm up my hammies and get that front leg over the arm and straight. Pose Dedicated to the Sage Koundinya II. 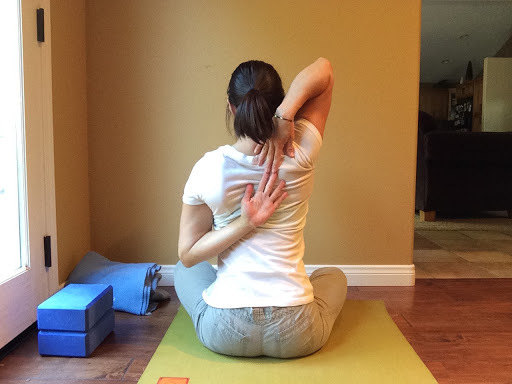 Eka Pada Koundinyanasana II. 9. Frustration is useless and will ruin your practice every time. It’s about being present and if you fill your mind with negativity your focus is lost. I only had to quit in the middle of a practice once, but during my shavasana I spent a little time considering how I would treat my following practices. It’s just stretching unless you are breathing, committing, and focused. 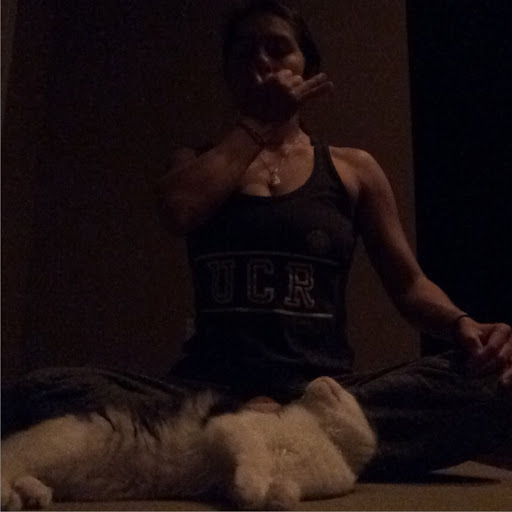 A few of my practices took more of a meditative turn. The heart wants what it wants. Pranayama (controlled breathing exercise). 10. 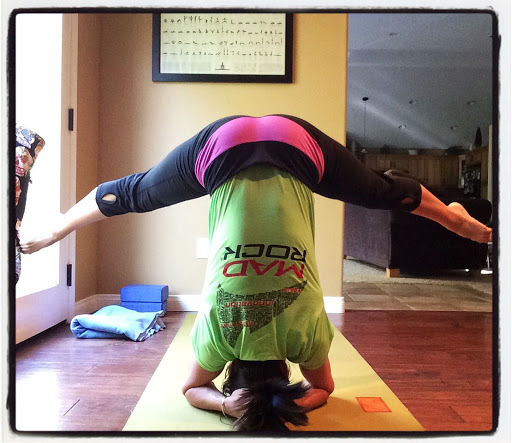 When I didn’t want to practice, I got back onto my mat and loved it even more. I never once regretted any of my practices, but I always kicked myself for procrastinating when starting them. In the end you know you will feel better afterwards, so just get on the mat and listen to what your heart sets on it’s intention for the practice. Next Next post: BCFF’s- Best Climbing Friends (Forever)!